Call us on 0736678070 or use our Free online tree removal and tree lopping quote form for a assessment on what will suit your needs. When do you need to remove a Tree? The science of tree lopping and removal is not and easy one and the professional tree removal experts at Capalaba Tree Removal are the best at analyzing and listening to your needs to make sure you get the tree services that are right for you. There are a massive amount of reason as to why you would need a tree removal or lopped and we have seen it all with our 15 years of tree lopping experience. Dead trees become a hazard to you and your family or can become a concern when over hanging building structures or your home. They can also become a breeding ground for pests such as bacteria, insects and termites. This can also be the reason for the tree to be come structurally unsound in the frist places. Also with new homes, renovations like decks or new structures being build like a shed or verandah we know that these trees and also their root structure can get in the way and also compromise the buildings structural sturdiness. We can either remove the tree; branches stump and all so you can reclaim the land and build on it. ​Once trees are cut down, you may find yourself facing one or more stumps littering your property. Our experienced arborists and stump grinding experts can take care of removing those ugly stumps so that you can improve your new landscape easily and quickly. We have the equipment and training to ensure that the stumps are removed or ground out so that you are left with an even piece of property. ​Trees, shrubs and other greenery add so much to the exterior of a home or business. However, without care, they can easily and quickly become an eyesore. Periodic and regular trimming and manicuring of trees, shrubs or bushes can help keep your property looking well-kept and attractive. 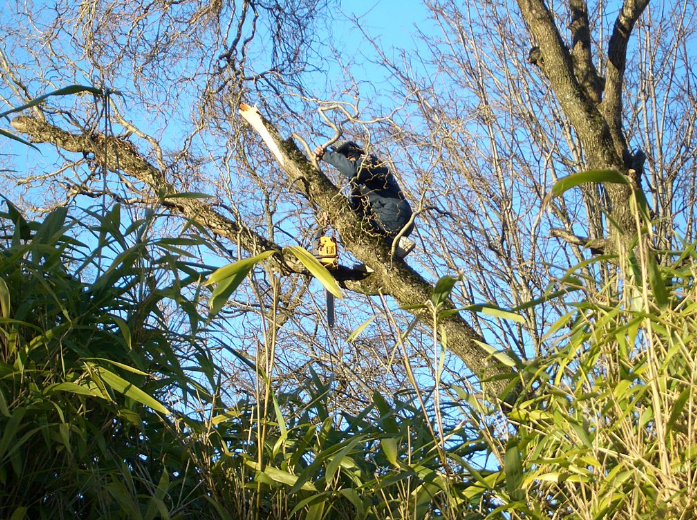 Call us at Capalaba Tree Removal to provide tree pruning and trimming services in Alexandra Hills, Victoria Point, Cleveland, Birkdale, Wynnum, Thornlands or Wellington Point. Our Capalaba Tree Removal Arborist are some of the best trained and experienced professionals in the Capalaba area. ​If you'd like trees moved from one area of your property to another, give us a call. Our arborists in Capalaba can take a look at your situation and let you know if your trees would be good candidates for our tree transplanting services. ​So what happens to the branches that are trimmed or the trees that are removed? We provide conversion services so that you can obtain valuable firewood for your stove, furnace, fireplace or camping trips and mulch for your landscape and gardens. Our firewood and mulching services include delivery for residents in Alexandra Hills, Victoria Point, Cleveland, Birkdale, Wynnum, Thornlands and Wellington Point. Overgrown trees and power lines do not mix. If your beautiful trees are starting to get a little too close for comfort to the lines that keep the power going in your home or business, give us a call. For Tree Removal in Capalaba as well as tree trimming services in Alexandra Hills, Victoria Point, Cleveland, Birkdale, Wynnum, Thornlands and Wellington Point, we are your best and cheapest tree removal solution. ​If you've found the perfect piece of property for your dream home at Capalaba​, Alexandra Hills, Victoria Point, Cleveland, Birkdale, Wynnum, Thornlands or Wellington Point , but it's covered with trees, call our company to help. Our arborists in Capalaba have years of experience in clearing land to give you the space for a new home. We understand how close trees can safely be to a new home and can help you with questions regarding shade, garden space and landscape design. Call us for tree removal in Capalaba. A tree surgeon or an arborist will come out to provide a free estimate. At Capalaba Tree Removal big machines for big jobs. This means trucks, lifts, long reaching chain saws and a lot of monkey work are need for the most professional, safe and effective removal of trees and tree stumps. As we know that these machines can cause some major damage, so to can they cause damage to yards, driveways, gardens and paddocks when engaging in tree removal procedures. The highly trained tree lopping professionals at Capalaba tree removal can make sure that your property looks at its best after the tree removal process has been completed. When we remove trees or grind stumps we endevour to make sure that large tree branches and stumps are removed and mulched. Entire tree Stump removal can allow you to reclaim the ground area where the tree was situated for a new garden or new structure. This stump removal process can also be a measure needed to ensure that the remaining stump isnt seen as a breeding ground for potential plant based diseases or termites. Which can cause damage to neighboring trees or structures later on down the track. The friendly, qualified and professional staff at Capalaba Tree Removal can come to you in your area of Capalaba​, Alexandra Hills, Victoria Point, Cleveland, Birkdale, Wynnum, Thornlands or Wellington Point and provide you with a large number of tree lopping, tree removal, tree cutting and stump grinding services. Our onsite tree lopping team will come to your location to provide a no obligation, no pressure quote and discuss your tree removal and budget needs. We promise to do this while ensuring our commitement to the highest quality tree removal work at the lowest, cheapest, best price. We have built up our reputation within the Capalba, Alexandra Hills and Victoria Point area as on of the most competitive and cost effective tree services. So if you need someone to your door today. Call us, Email us or use our free tree lopping quote form today and experience the Capalaba Tree removal Difference. Pick up now and talk to one of out Capalaba Tree Removal staff on 0736678070. Alternatively use our Capalba Tree removal online quote form and a free instant quote and someone from our team can contact you back immediately with the lowest possible prices for you Tree Removal and Stump Grinding job. Call, email or use our free online quote form now and start enjoying the Capalaba Tree Removal difference.